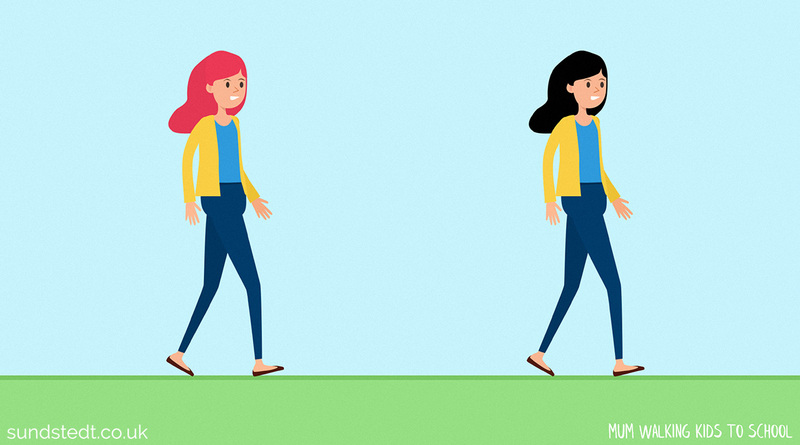 Partner with us to make a premium animated explainer video. Let’s chat! 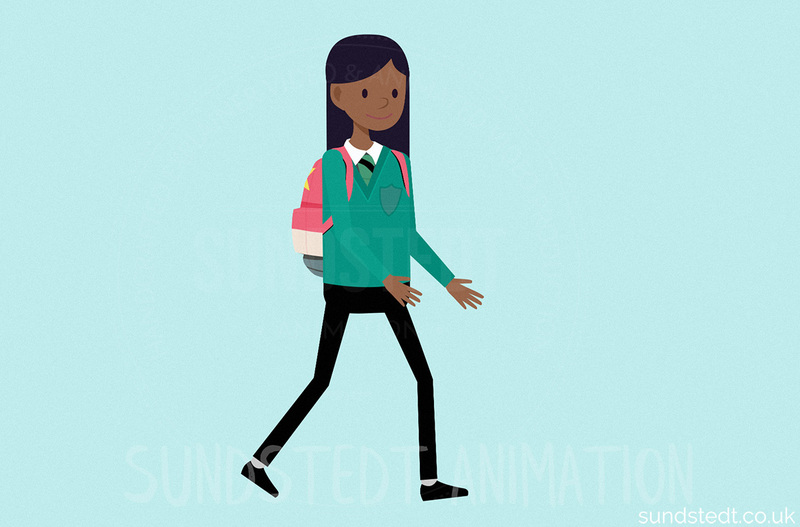 Glasgow City Council Road Safety Unit teamed up with Anders Sundstedt at Sundstedt Animation to make a premium, handcrafted animated explainer video – Promoting Active School Travel. 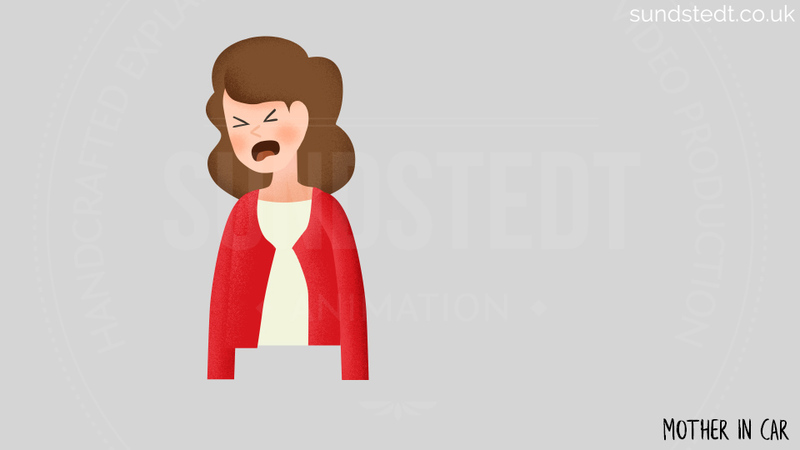 Partner with us to make a premium quality 2D animation. Let’s chat! 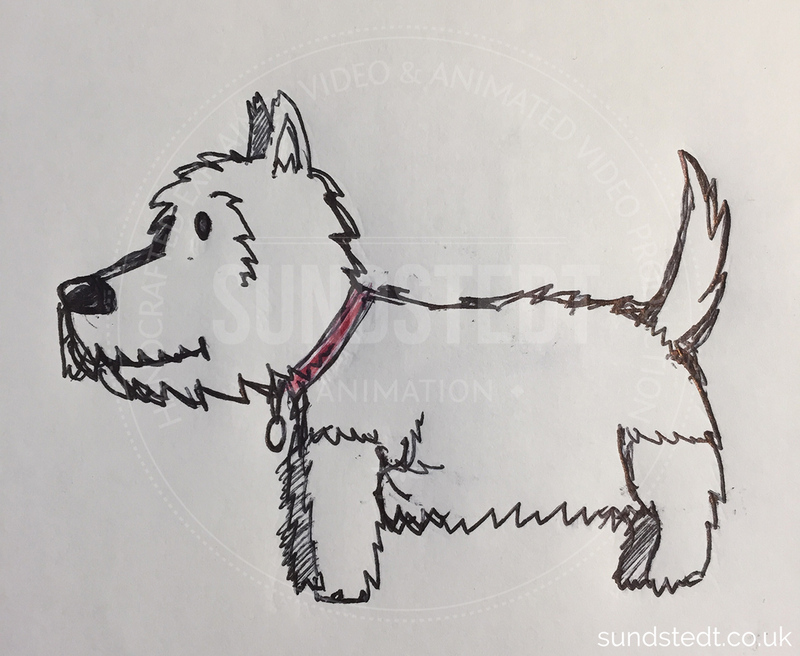 Glasgow City Council came to Sundstedt Animation interested in working with us, wanting to develop an exciting animated explainer video for their new big campaign. 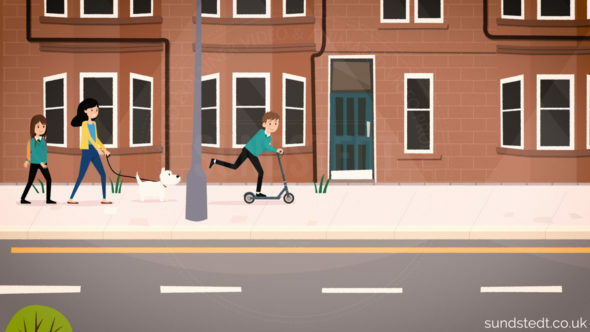 The animation will be used by Glasgow’s Road Safety Unit to promote active travel to school and the implementation of new ‘school car-free zones’ in 2019. 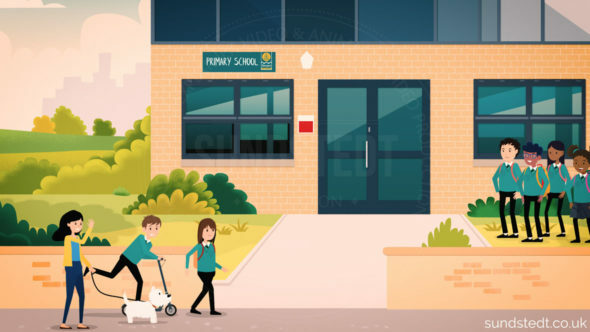 The Active School Travel Programme is an exciting initiative for schools who wish to see more of their pupils choosing an active and healthy journey to school. The Go Safe Glasgow Road Safety Partnership brings together a wealth of experience and includes representatives from Glasgow City Council, Police Scotland, Scottish Fire and Rescue, NHS Greater Glasgow and Clyde and Glasgow Community and Safety Services. We presented Glasgow City Council with options in animation techniques, styles and methods. We suggested using 2D animation that would be compelling and fun to watch. We asked the client to provide a script for the video. It was a perfect match. Anders Sundstedt created all the designs, graphics, artwork, character designs and illustrations for the video content for all scenes in the animation in his own unique style. 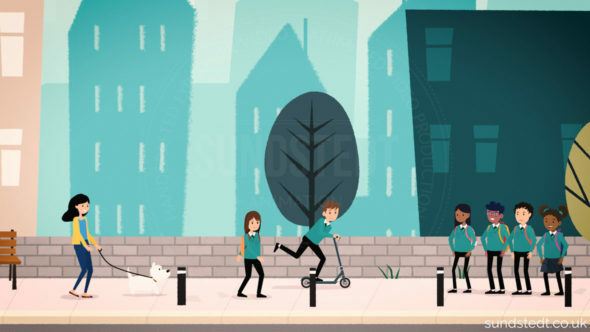 We decided to go for a premium quality design with detailed illustrations, background compositions and with cinematic camera moves used throughout the video. The client was presented with many character designs for approval. 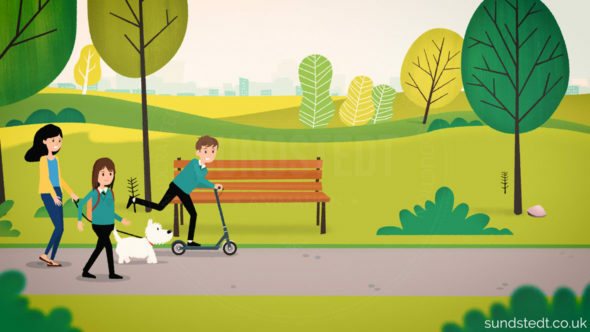 This video features 13 different characters and many large and detailed 2D background designs and artwork, which took up a large part of the video production timeframe. We wanted to make sure everything looked great and we had all characters, props and backgrounds artwork designed and approved by the client before animation started. We asked the client to provide the voice-over artist selection and recording. We talked in great detail with the scriptwriter and VO artist, explained what to think about regarding 2D animation and made some suggestions on the best ways of animating each scene and feasibility. 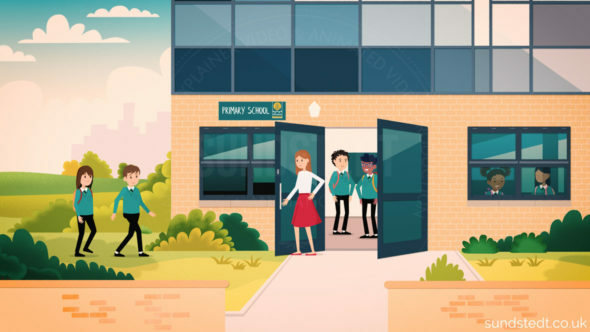 We communicated regularly with the scriptwriter and the client throughout the production of this animated video, for approval of all artwork content and to ask them questions about the video, characters and our suggested end title screen. Finally, we put it all together, adding final touches, VO and music. The video has been completed and is to be live sometime this summer, but an information page should be up and running on the Glasgow City Council website in the next month. It will also be on the School Travel Plan page on www.gosafeglasgow.com very soon as well. 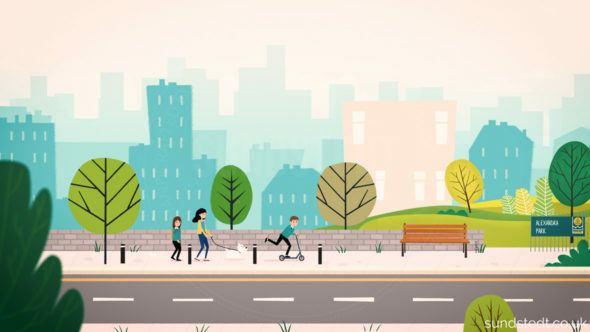 When measuring the success for an animated campaign & awareness video content like this one, it is best done by looking at social engagement, for example the number of views, visits, shares, likes & traffic to your website, here with the goal to promote active travel to school and the implementation of new ‘school car-free zones’ in 2019. 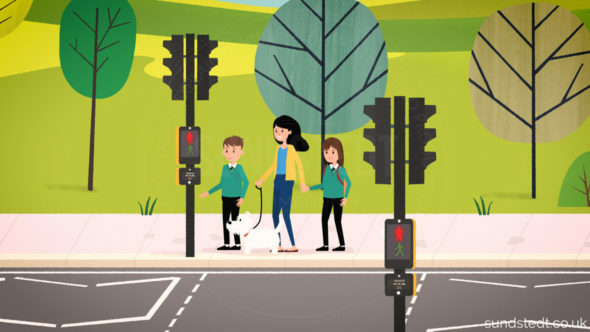 The fundamental aim of the programme is providing schools with the skills and knowledge to get more children walking, cycling and scooting as their main mode of transport to school. 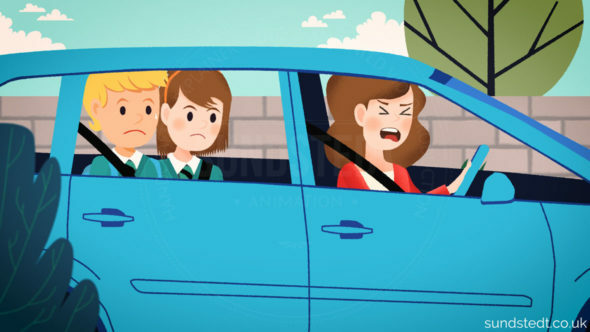 For us the actual reward is that they trusted us to produce this video for such an important goal of promoting active school travel and road safety, helping to save lives and promoting healthy living. 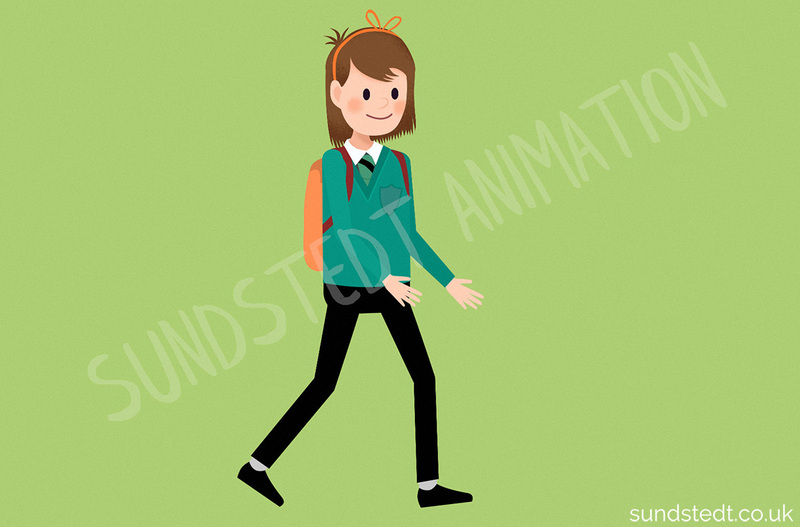 This gallery show some work in progress, sketches, character design concepts, behind the scenes images and other images from the Promoting Active School Travel animation by Sundstedt Animation.